Buoyed by the success of our first hike, we felt ready to tackle another. So confident were we that we decided to forego the usual research, deeming a quick scan through the first of many travel blogs sufficient. 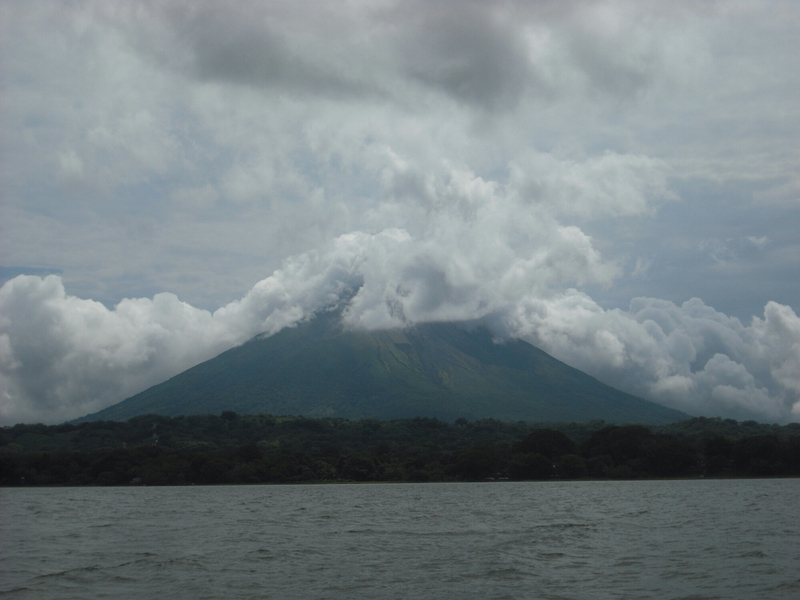 Somewhere, someone said we could walk up Madera Volcano (Ometepe) without a guide. That was good enough for us. That morning, the breakfast we thought we’d pre-ordered didn’t materialise so we opted for some slices of bag-squashed bread with a light spread of bag-dried peanut butter, all washed down with three large mugs of sweet coffee. Setting off around 9am, we were sure we’d be back well within the 8 hours proclaimed on the sign at the foot of the national park, and we’d packed accordingly: one bottle of water and a handful of crackers was all we’d need. Things started well. 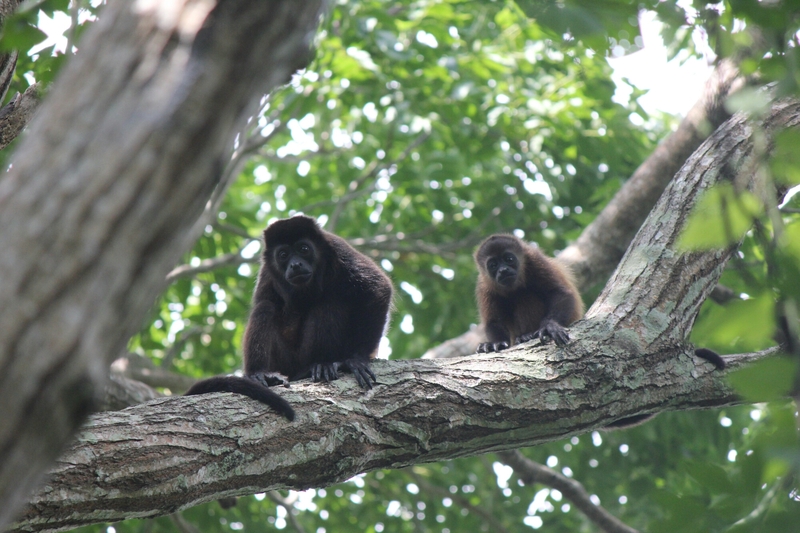 Within minutes we were surrounded by nature’s loudest alarm, the guttural call of a family of howler monkeys. Soon we could see the tell-tale dip in the branches as they moved closer, and found ourselves looking straight at them as they hung from their tails to get a closer look. After the obligatory photo shoot, we left them to their breakfast and were soon hiking up through the wet forest, sweating buckets as the humidity clung on. The combination of heat and poor hydration started to take its toll earlier than usual, and I had to stop regularly to catch my breath. 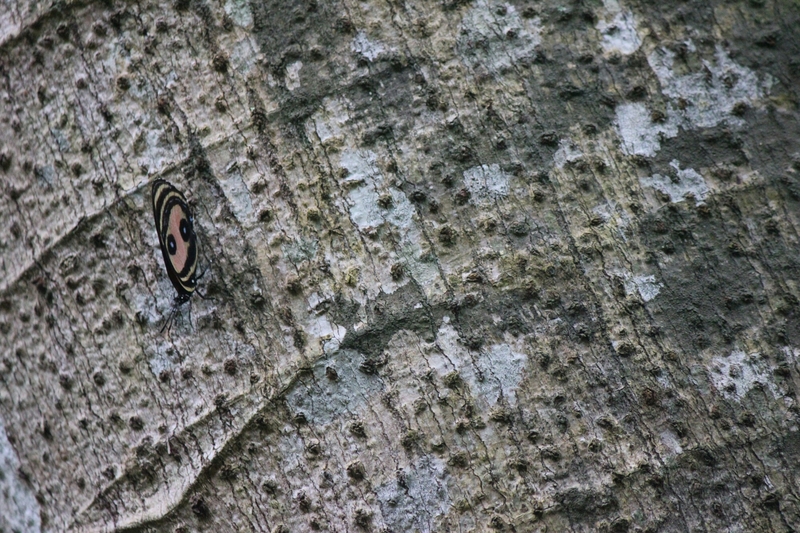 During one breather the trees above began to sway and were soon filled with the much smaller capuchin monkeys. Cute as they were, we’d both watched enough David Attenborough to know that their somewhat sketchy demeanour suggested we were on their patch. So, filling our lungs as best we could, we carried on. The terrain was punishing. When not churned mud, the ground was covered in a metro map of tree roots, or, even better, actual swamp. We met two groups coming down as we ascended: the first said nothing but “good luck”, their mud soaked trousers giving a hint of what was still to come. The second only asked where our guide was, with panic in their eyes. As we headed roughly upwards, the slope grew even steeper, and as each bend revealed ever more climb we realised we had to ration our dwindling water supplies. Further ahead entire felled trees blocked our path and we had to rely on low-slung vines to help us make it across the deepest mud. More than once I misjudged the height of the trees above me and clattered into hard wood; finally, a branch snapped backwards, catching me straight across the forehead. Determined not to cry, I instead was reduced to mono syllables – a sure sign that my patience for heading blindly upwards, away from home, was wearing thin. Finally, after hours of clambering up rocky river beds, tripping over endless hidden, mud-covered tree roots and narrowly avoiding grabbing handfuls of ant-infested vegetation to break our fall, we reached the summit. The view across the lake was spectacular, and ours alone. 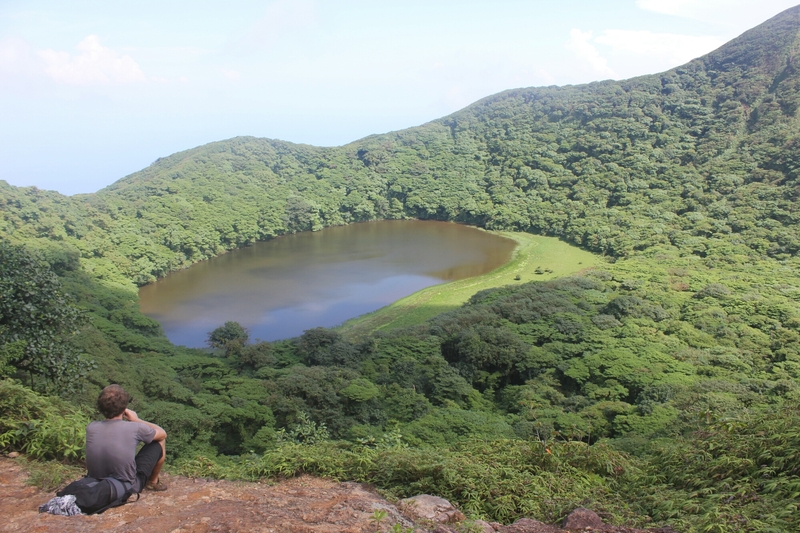 Buzzards soared above our heads and the sea breeze flowed around the valley carved into the mountain as sunlight played on the lake below. It was a poetry-worthy sight. Duly relieved of my frustration, we finished off the last of our water and started our way back, happy in the knowledge that we were heading back to civilisation. There was even a lightness to our steps as we tackled the trail in reverse, those same branches aiding our primate-like swings over the churned clay. My silence switched to happy banter as we dicussed which drinks we’d buy first when we emptied the nearest tienda of its supplies. Nothing but getting lost could put a dampner on my mood. So, obviously, we got lost. We hadn’t even noticed when we strayed from the right path, all mud and branches looking pretty much the same. It wasn’t until we hit new and thick, knotted coffee plantation that we realised something was amiss. We persevered with our chosen path, desperately trying to ignore the fact that the sun was setting. I tried to take comfort in the fact that coffee meant a finca, and fincas meant people, until I remembered we’d just been told that it was terrain exactly like this that had been used in the war between the FSLN and the contras on the Honduran border, because it was so easy to hide in – or hide the bodies in. Despite the setting sun the heat was intense and with no water the panic levels started to rise. Chris had obviously read the alternative version of ‘How to Motivate People‘, using phrases like “I think we’re running out of light”, “we’re definitely not in the right place now” and, my personal favourite, “I know it’s dark, we’re lost and we’re going to die, but look at those ants – they’re all carrying leaves!” By this point any attempt to avoid getting muddier had been abandoned, and we staggered through deep puddles like drunk women walking home without their heels on, propelling ourselves forward head first and willing our feet to keep going. The coffee plants were never ending, and the slope so steep and rocky we were falling at every third step. The shadows around us were growing longer and at one point we reached a dead end, with nothing but sheer drop into the vast lake below. Retracing our steps, we came to a cross-roads and had to make a choice – the wrong one and we’d be heading further in to uninhabited jungle. Parched beyond belief and with no way of knowing where we were, I’d settled into unhelpful, silent terror. The nadir of my internal over-reaction came around the time the expression “this too shall pass” flashed across my brain. Mercifully, it was ridiculous enough to snap me out of dramatism and make me focus on finding our way out. Finally, the ground levelled and we found ourselves in recently worked fields. We eyed plastic rubbish dotted here and there in hope of half-finished drinks, and followed the well worn trail in what we hoped was the direction of town. And then, at last, we spotted human life – a farmer taking his cows to the river. Sweaty, pale and babbling a stream of poorly expressed Spanish, we must have looked insane. Thankfully, he didn’t run away and instead simply nodded, beckoning us to his camp with a wave. As we collapsed in a heap, we roused the farmer’s son, who emerged from his hammock with a curious grin. It transpired we weren’t the only idiot tourists to have got lost here; they’d rescued others before. In fact, the farmer knew just what to do, appearing from behind us with two freshly cut watermelons, still hot from the sun. What followed was not refined, with both of us setting about the slices of fruit with pure, animalistic desperation. Chris at least attempted basic conversation while I sunk my whole face into the sweet flesh, gurgling and dribbling with utter abandon. The farmer’s son – Miguel – took us the rest of the way to the main road, though not before revealing that someone had died getting lost on Madera at night. As we ached our way home, the darkness fully set in and a thunder storm rolling in around the mountain, we resolved to never, ever be that stupid again.